1. 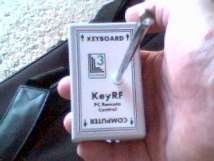 A very small, keychain-sized remote. Other remotes out there designed to control a computer can be the size of a regular TV remote. 2. It runs via RF, which means it uses radio waves to communicate with the receiver, and can transmit through your pocket. 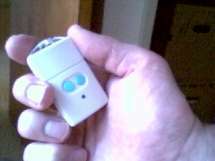 A typical TV remote uses IR, or infra-red, and you have to point the remote at your TV or VCR for it to work. Many inexpensive computer remotes work this way, at much lower prices than this unit, but you have to physically point them at the reciever. I wanted something to hide in my pocket. Then I could tap a button, and have a music cue play. 3. It’s programmable -- you can set it up so the buttons trigger any keystrokes you need. With two buttons, you can have five different commands. Here’s the remote. It’s the same size as the kind used for car alarms. This is the receiver, it plugs into the PS/2 keyboard port of a laptop. You can get a USB adaptor if you don’t have a PS/2 keyboard port on your laptop. 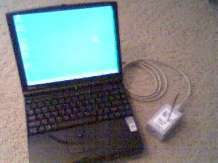 The receiver next to a laptop.